Fish and shellfish are excellent sources of protein and omega-3 fatty acids, the healthy fats that naturally decrease inflammation in our bodies. 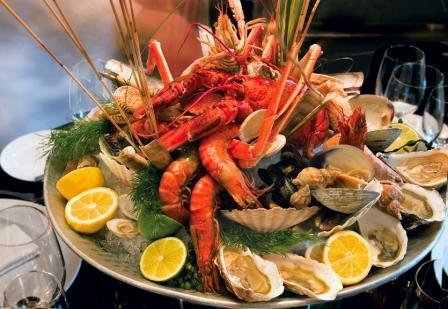 However, shellfish, such as shrimp and clams, naturally contain higher levels of cholesterol as well as omega-3’s. This has lead to a controversy concerning whether or not foods containing cholesterol, especially the low-density lipoproteins (LDL’s) which are a risk factor for coronary heart disease (CHD), should be included in a heart-healthy diet. In order for an individual to decrease his/her cholesterol, the National Heart, Lung, and Blood Association’s National Cholesterol Education Program (NCEP) suggest a heart-healthy diet contain no more than 200mg/d of dietary cholesterol. However, a study published in Cellular Molecular Biology this past February suggested that the consumption of cold water prawns, at least in healthy, male subjects, does not affect LDL cholesterol levels in the blood. The prawn intervention group ate 750 mg/d of dietary cholesterol and was compared to a control group that consumed 200 mg/d . The intake of omega-3’s from prawns was estimated to be between 0.5-0.7 g/d for the intervention group. The researchers concluded there was little evidence to suggest prawns need to be restricted for individuals trying to decrease their total blood cholesterol. Another study published in 2000 concluded that dietary cholesterol has little effect on the plasma LDL/HDL ratio. Analysis of the available epidemiological and clinical data indicates that for the general population, dietary cholesterol makes no significant contribution to atherosclerosis and risk of cardiovascular disease (McNamara, DJ, 2000). Finally, in this upcoming November issue of Current Atherosclerosis Reports, there is article suggesting the need for the United States to revisit their dietary guidelines for dietary cholesterol (Fernandez, ML, et al., 2010). This article suggests that clinical studies have shown that even if there is an increase in dietary cholesterol that may result in elevated plasma LDL cholesterol in certain individuals (hyper-responders), there is always an accompanying increase in high-density lipoprotein (HDL) cholesterol. Therefore, the LDL/HDL cholesterol ratio is maintained. Ideally, we want our LDL/HDL cholesterol to be at a 2:1 ratio. More importantly, dietary cholesterol reduces circulating levels of small, dense LDL particles, which are a well-defined risk factor for CHD (Fernandez, ML, et al., 2010). Based on these studies, we can enjoy and celebrate National Seafood Month with a healthy dose of seafood that may contain cholesterol, and not worry about increasing our risk factors for CHD. Bon appetite!